6 Essential Strategies for Physician Integration | Hospital-Physician Relationships. Integrated physician arrangements, aligning clinical and financial interests, will be critical to the success of hospitals and health systems in the future as payment methodologies change, says Mark Grube, managing director at Kaufman Hall in Skokie, Ill. Here he outlines six essential strategies for physician integration. 2. Ensure sufficient capital for physician initiatives. Buying physicians practices can be a very expensive strategy, even though hospitals are no longer buying the goodwill of a practice. In addition to buying the practice, hospitals are also assuming leases of the physicians’ offices. Employment agreements tend to last three years, meaning the hospital will continue losing money if the physician is not efficient. “The hospital needs to ensure there are sufficient resources to meet the needs of the community,” Mr. Grube says. 3. Use a disciplined approach to practice acquisitions. Since hospitals now typically recruit for employment, rather than trying to place an independent physician in the community, they need to make sure they won’t lose money. “Do your due diligence when buying an existing practice,” Mr. Grube says. The hospital should undertake a detailed study of the practice, looking at revenue trends, how it is managed, the quality of the staff and the IT systems it uses. “You need to understand how these factors ill impact your organization,” he says. 4. Structure effective physician compensation programs. Hospitals are moving away from salary-based compensation. The next step is providing bonus arrangements for compliance with defined protocols and working on quality, cost reduction and “good citizen” points. 5. Create effective clinical integration programs. In such programs, both the hospital and a group of physicians jointly contract with a health plan and agree to incentives that involve achieving high quality and reducing costs. “These agreements can be a stepping stone to becoming an ACO,” Mr. Grube says. The physicians can be employed or in independent practices aligned with the hospital through a physician-hospital organization. 6. Manage employed physicians to achieve goals. “Just bringing physicians into the employment model won’t accomplish anything,” Mr. Grube says. The practices can be brought together under one structure or kept separate, but the hospital needs to implement strategies for efficiency, such as using one answering service or one IT system and creating a common set of goals. Learn more about Kaufman Hall. From all of us at Pinnacle Healthcare Consulting. At this holiday season, our thoughts turn gratefully to those who have made our progress possible. 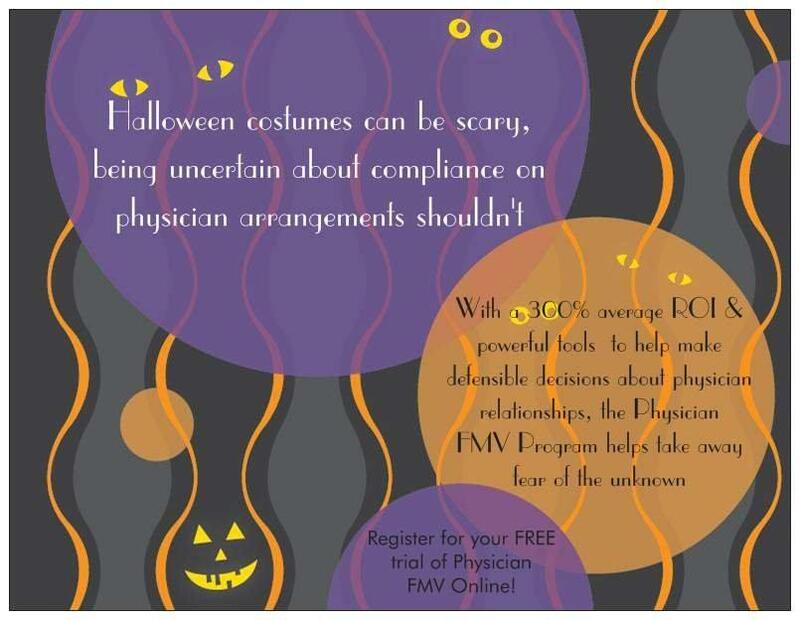 Compliance Concerns Giving You the Spooks? 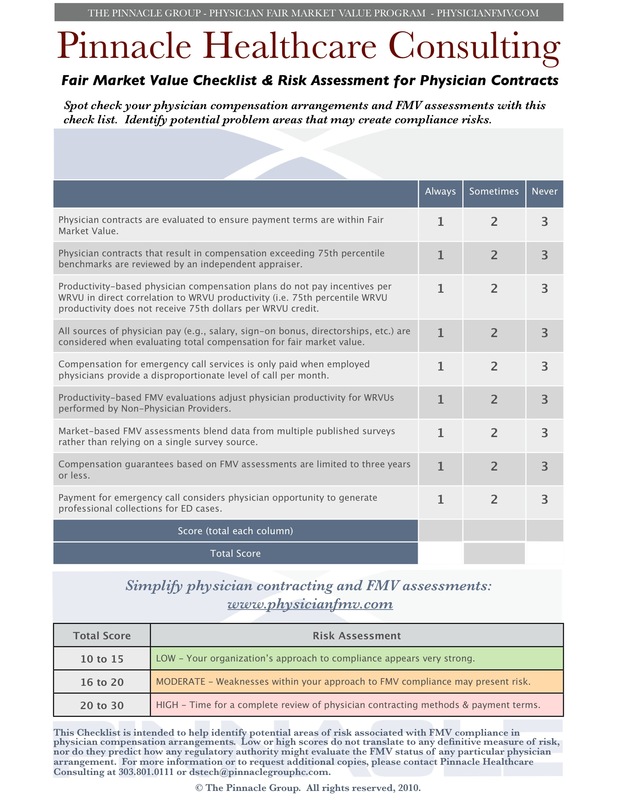 About The Physician FMV ProgramDetermining appropriate and compliant physician fair market value (FMV) is complicated. Diverse factors like the Stark Law and inconsistent internal payment policies make it difficult to confidently approach physician compensation negotiations. Until now. The Physician Fair Market Value (FMV) Program dramatically reduces the complexity of determining fair market value for physician compensation. It builds internal capacity and gives hospitals more control over the process by providing proprietary tools and powerful information to help make defensible decisions about physician relationships. Hospitals using the Physician Fair Market Value (FMV) Program immediately possess greater knowledge on which to base physician contracting decisions, the reliability of a proven physician fair market value analytical methodology and improved capacity to manage / document compensation and other contractual terms. Furthermore, Physician Fair Market Value (FMV) Program support includes: training, ongoing coaching, technical support and focused consulting (if necessary). Pinnacle Healthcare Consulting provides a range of strategic, financial and operational services to improve clinical and business performance for hospitals, health systems, physician groups and other healthcare organizations. Pinnacle Healthcare Consulting is a nationally recognized leader in business valuation, physician compensation, medical staff planning, performance improvement and compliance support. Other divisions of Pinnacle provide physician practice management, medical bill/coding, and technology/integration support services. Pinnacle’s array of specialized and highly responsive client services promote advanced innovation while our dynamic team solidifies strong client relationships and assists in solving your most complex challenges. 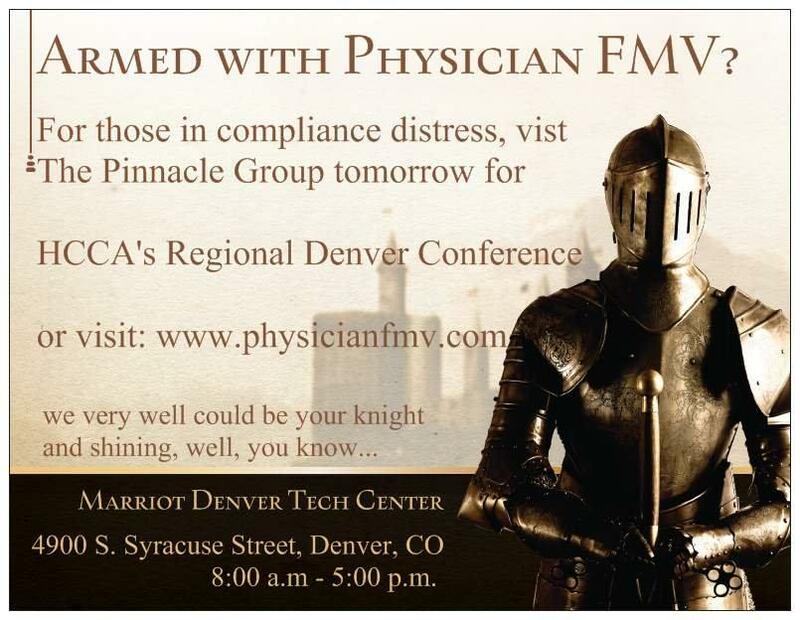 Avoid Physician Fair Market Value Distress – Arm Yourself With Physician FMV and Visit The Pinnacle Group Tomorrow at HCCA’s Regional Conference in Denver, CO! Feel free to give us a call either way with comments or questions! The Pinnacle Group provides a range of strategic, financial and operational services to improve clinical and business performance for hospitals, health systems, physician groups and other healthcare organizations. Pinnacle Healthcare Consulting is a nationally recognized leader in business valuation, physician compensation, medical staff planning, performance improvement and compliance support. Other divisions of Pinnacle provide physician practice management, medical bill/coding, and technology/integration support services. Pinnacle’s array of specialized and highly responsive client services promote advanced innovation while our dynamic team solidifies strong client relationships and assists in solving your most complex challenges. 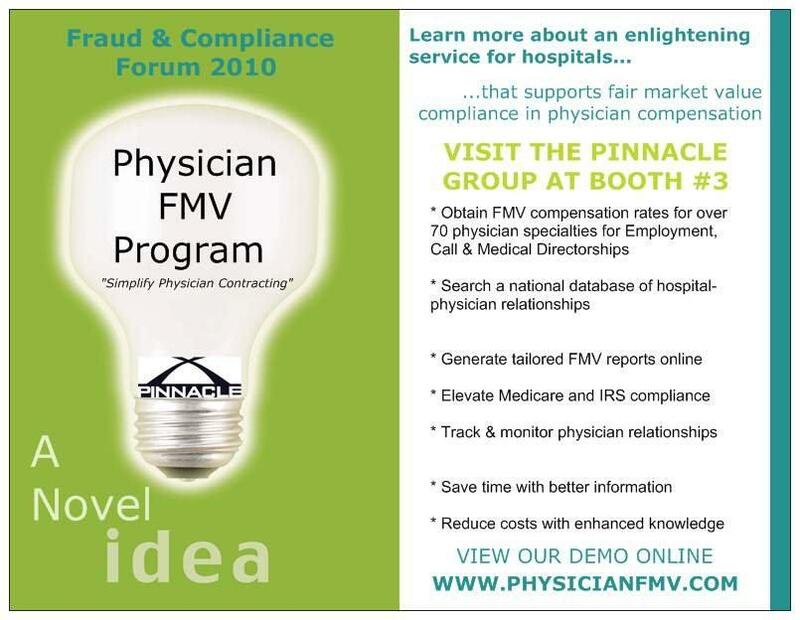 The Physician FMV Program dramatically reduces the complexity of determining physician fair market value. The Program helps you build internal capacity and provides you with more control over the contracting process with powerful information and proprietary tools to help you make defensible decisions about physician relationships. Visit: www.physicianfmv.com for more information about our services. We have assembled an expert team of advisors that understand physicians as well as the unique situations and challenges you face. Business issues affect your Practice and personal wealth’s bottom-line. This seminar will give guidance concerning hot topics in your career and touch on important financial themes facing physicians in today’s ever-changing environment. In this seminar, we will give you the tools to advance your wealth and protect your investments. Medical Practice Valuation- A Physical Exam of a Practice Health – Whether you are buying, selling or considering integration with a hospital system, the valuation of a medical practice is a subject that deserves your attention. Jim Connors, Director of Business Valuation for The Pinnacle Group, will discuss reasons to consider a transaction, the variety of nuances related to fair market value and creating practice value as well as the pitfalls to avoid in either buying or selling a medical practice. With 20 years of business valuation, financial and market consulting experience, Jim has assisted clients in a variety of industries and types of transactions. Jim has been recognized within the valuation community for his published articles, presentations on valuation techniques and analyses for specific sub industries and relevant, regulatory compliance issues. Financial Planning- The Prescription for Your Personal Wealth – As your wealth grows, life doesn’t get simpler, it gets more complex. Patty DeLucas, Certified Financial Planner, TM and Financial Advisor with Wells Fargo Advisors, LLC, will present a three-step approach to managing your financial investments with clarity and consistency. Her discussion will include leveraging assets and people to increase wealth as well as delineate a personalized, financial roadmap that connects money with life priorities. Patty will also cover tax efficient asset accumulation strategies, how to protect your investment portfolio against disaster, and Roth conversions as a strategy for multigenerational wealth. Patty has over 33 years of professional experience which includes ten years in the securities industry with astute investors. As an investment advisor representative, she holds a CPA license (not currently in public practice), securities registrations and insurance licenses. Estate / Succession Planning- Preventative Care for Future Health & Wealth – Jim Miles, Esq. will discuss the impacts of estate planning on the physician group practice entity, focusing on Stark / Anti-kickback and tax compliance issues. Jim, an attorney with the Denver and Phoenix offices of Miles & Peters, has been practicing health law for over 15 years. He specializes in the representation of health care providers and professionals, emphasizing commercial transactions, Stark and Anti-Kickback compliance, and business planning. His clients include numerous health care providers such as physician practice groups, hospitals, nursing homes, assisted living facilities, community health centers, and other health care providers. He serves as general counsel to several health care provider trade associations. Additionally, Janine Guillen, Esq. 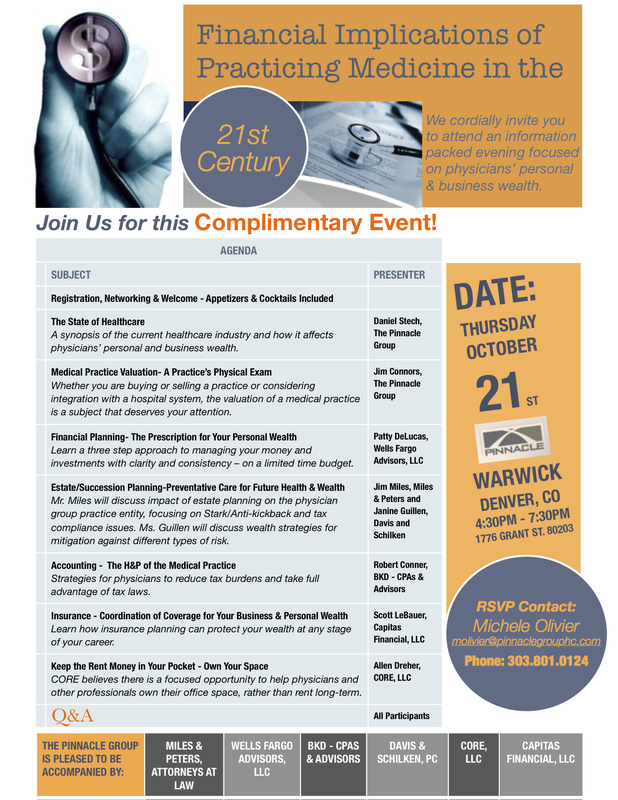 will discuss the impacts of estate planning on a physician’s personal wealth and wealth preservation. Janine joined Davis and Associates, P.C. after 15 years in healthcare operations and administration. She concentrates her legal practice on estate planning, wealth preservation, asset protection, estate / trust settlement, business / business exit planning and medical / disability planning. She has presented at national conferences, lectured to students and families in higher education venues and has taught on a variety of topics. Accounting – The H&P of the Medical Practice – Changes in our tax laws are one of the few constants of American life. Every change adds a new layer of complexity to an already complicated process. Physicians need to develop strategies that will allow them to take full advantage of the tax laws to reduce tax burdens. Robert Conner, a Tax Supervisor at BKD CPAs & Advisors, specializes in physician, personal, medical practice tax planning and compliance. Development of an advantageous tax strategy allows physicians to plan for their future. Since virtually every financial decision can have tax implications, careful tax planning can make a big difference in the outcome. This forward-thinking approach can help physicians grow and preserve assets, defer income, and reduce taxes on their income, estate, gifts, investments and retirement distributions. Insurance- Coordination of Coverage For Your Business & Personal Wealth – Scott LeBauer, CLU, ChFC, a specialist in physicians’ insurance for over 21 years, will give guidance on how insurance planning can protect wealth at any career stage. His expertise includes individual life insurance for spousal / family protection, buy-sell funding, as well as accumulation planning. He is currently an associate general agent with Capitas Financial, LLC and Vice President at Prestige Brokerage, LTD. Scott has worked with physicians on insurance and accumulation planning from the early stages of practice development to associated insurance protection for the transition of a physician practice into retirement. Additionally, he has been published for insights into aspects of Long Term Care planning and the current evolution of that industry. Falling Behind on Physician Fair Market Value? 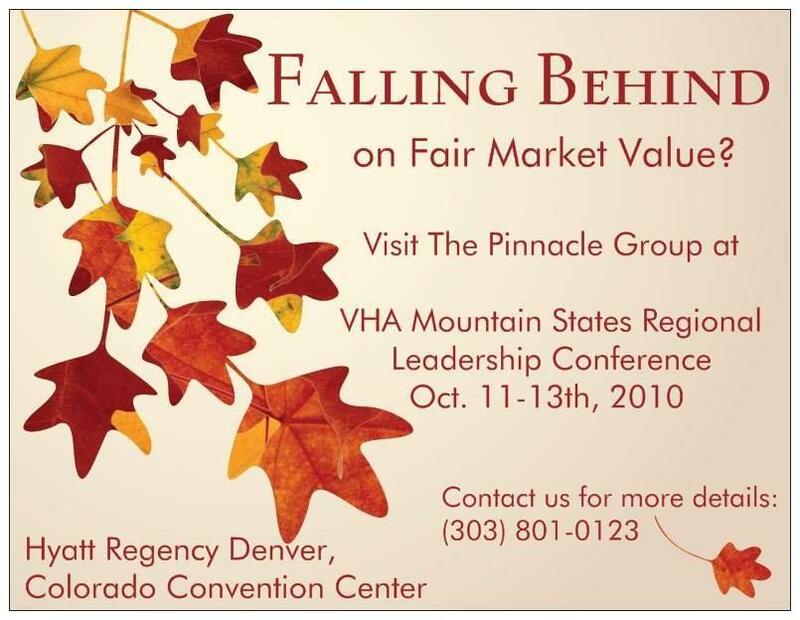 Vist The Pinnacle Group at VHA’s Regional Leadership Conference! The Pinnacle Group provides a range of strategic, financial and operational services to improve clinical and business performance for hospitals, health systems, physician groups and other healthcare organizations. Pinnacle Healthcare Consulting is a nationally recognized leader in business valuation, physician compensation, medical staff planning, performance improvement and compliance support. Other divisions of Pinnacle provide physician practice management, medical bill/coding, and technology/integration support services. Pinnacle’s array of specialized and highly responsive client services promote advanced innovation while our dynamic team solidifies strong client relationships and assists in solving your most complex challenges. Visit: www.physicianfmv.com for more information about our services. 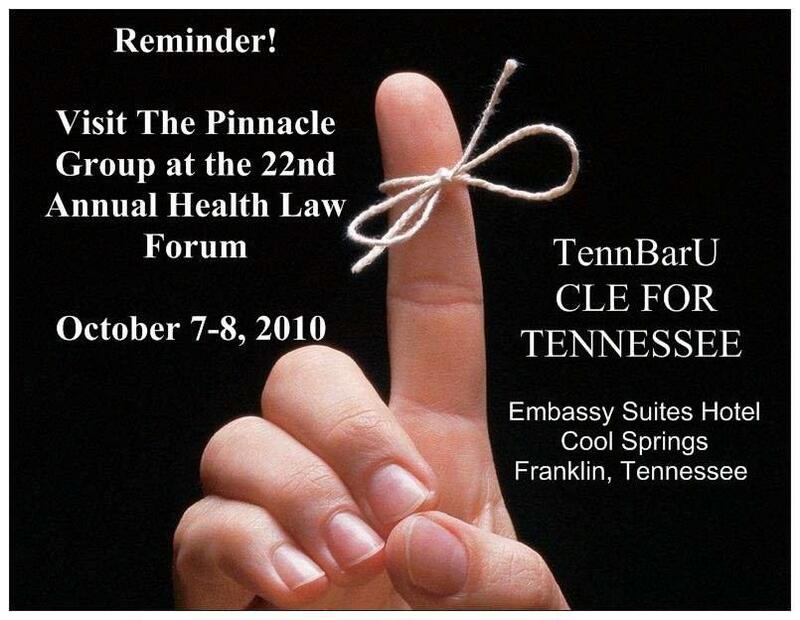 A friendly reminder to visit The Pinnacle Group at TennBarU CLE for Tennessee 22nd Annual Health Law Forum. Now you can spot check your physician compensation arrangements and FMV assessments with Pinnacle’s specially created check list. Identify potential problem areas that may create compliance risks. Fill out the survey to find out your risk assessment number. The lower the score, the stronger your compliance is for fair market value. If the number is on the high side, it might be time for a complete review of physician contracting methods and payment terms. 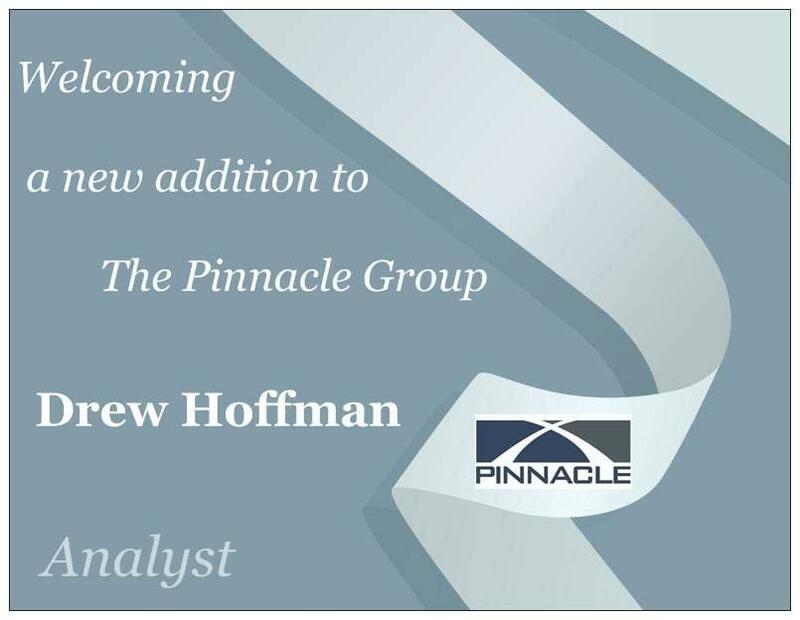 The Pinnacle Group is excited to extend a warm welcome to Mr. Drew Hoffman, a recent addition to the Pinnacle Team as Analyst. Drew will support Pinnacle’s healthcare physician compensation, valuation and appraisal divisions, with a focus on fair market value analysis of professional service arrangements. He additionally provides market research, financial analysis and business plan development. Prior to joining Pinnacle, Drew interned at Arthur J. Gallagher & Co., a company known as one of the world’s largest insurance brokerage and risk management service firms that provides a full range of retail and wholesale property/casualty (P/C) brokerage and alternative risk transfer services, as well as employee benefit brokerage, consulting and actuarial services. During his time at Arthur J. Gallagher & Co., he created a 401k portfolio performance benchmarking template, composed requests for proposal and insurance renewal materials and participated in a regional intern project. In his free time, Drew enjoys participating in outdoor activities such as wake boarding and playing softball. Drew additionally enjoys attending listings on the silver screen when he is not participating in Colorado’s outdoor recreation. The Pinnacle Group will be attending the Fraud & Compliance Forum (HCCA & AHLA) at the Renaissance Harborplace Hotel in Baltimore, MD – September 26 – 28th. PRE-ENTER our drawings for a Physician FMV Program license or iPod nano! 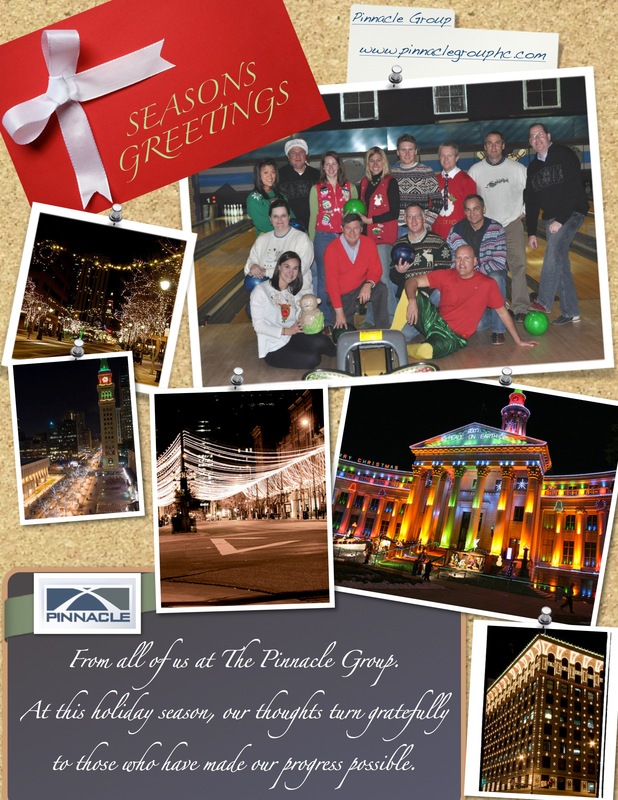 E-mail: kberkey@pinnaclegrouphc.com with your name, title, organization, address and phone number for your chance to win! Be sure to visit us at Booth #3 to say hello. Determining appropriate and compliant physician salaries is complicated. Diverse factors like the Stark Law and inconsistent internal payment policies make it difficult to confidently approach physician compensation negotiations. Until now. The Physician FMV Program dramatically reduces the complexity of determining physician fair market value in physician arrangements. The Program helps build internal capacity and provides hospitals with more control over the contracting process. Our powerful information and proprietary tools empower hospitals to make defensible decisions about physician relationships, backed by our third party opinion.